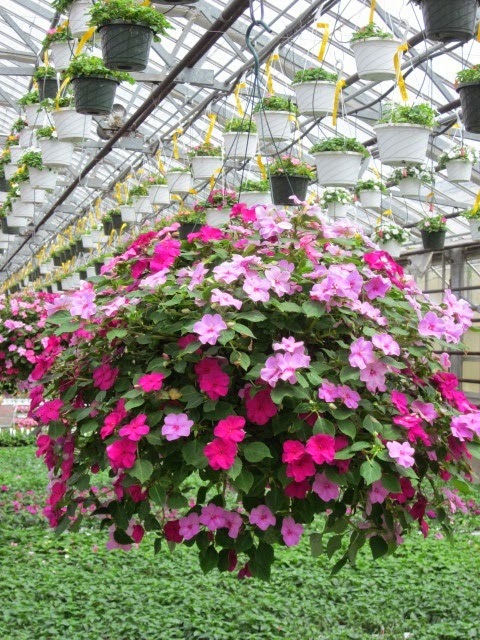 How have you done with impatiens over the past few years? 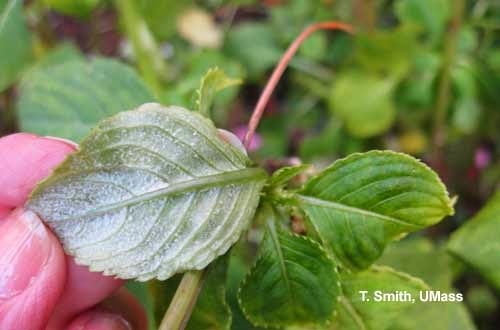 No doubt you've heard about that nasty little spore that caused the Impatiens Downy Mildew problem that's swept from the South to the West and then across the Northern states and finally all the way to the East coast. If you have had this mildew kill your impatiens plants in your garden you should probably continue to avoid them. Unfortunately the spores are known to linger in the soil for up to 5 to 10 years. 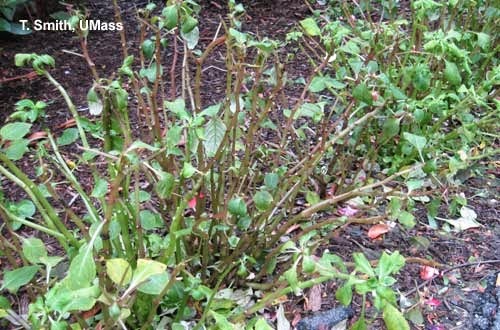 Here is a link to an article about the Impatiens Downy Mildew. Some people said they were going to just grow them in hanging baskets hoping to avoid the ground contamination. That sounded smart to me as long as they came to you free of disease. If you end up with sick plants they recommend digging them up, removing any of the plants leaves laying around, bag them up and dispose of them. Don't put them on your compost pile. Last year I wanted to test an area with a few plants to see how it would go and put a few out back at my fairy garden and they did fine. These were from a local grower. I chose wax begonias last to put around the fountain area last year because I wasn't willing to take the chance of planting that whole area only to have it all die back. My only disappointment was that on the right side which is the heaviest with shade, the begonias didn't grow much. The impatiens are better at flowering with less sun. As you can see in 2012 the impatiens did real well. I really like how they fill out and they really are my favorite for shade gardening. I'm feeling gutsy this year and may go ahead and give the impatiens a try again, especially since I know my garden centers can get them from local growers. I know the stronger colors show up better so I will keep that in mind when I look! Oh my goodness, what a charming fountain area, it's beautful and oh so, peaceful! I have impatiens in hanging baskets and they are doing well. Hope they do well for you! Whatever flowers you choose for the fountain area will be just gorgeous! I hope things work out with your impatiens as they look lovely in your garden. I have way too much sun for them so if you replant them this year I will have to enjoy yours. Never had a problem with them, they come up every year but only get one colour. I haven't planted impatience for a couple of years and was thinking of trying them this year. I will take your advice, though, and avoid the big box stores and find mine from a local grower. I bought two flats of impatiens this week. I'm goin' for it. I put them in pots and the ground. I'm crossing my fingers. I guess time will tell. As much as I love Begonias I have to admit the Impatiens looked spectacular for you. If you do them I so hope it works out for you without any problems. Nice area! There was a problem with Impatiens over here too, I can't remember the last time I saw them for sale. I've always had good luck with impatiens...until last year. I put the plants out, they looked fine for a few weeks and then just died. So,no impatiens this year. I got them at of of the big home improvement centers, so I'm guessing them came with the disease. Love your little fairy garden with the mini hostas...too cute. Your garden is always so beautiful! I hadn't heard that about the impatiens. I love those flowers and have them often in our garden. Will have to get them from a local nursery. Hope they do well for you this year. I opted to pass on impatiens once again this year. There are the odd ones available but I'm not going to risk it. I went with torenia for my tipsy pots this year and so far they look really good. Hoping they improves as the season progresses. Good luck with yours. Your garden is looking wonderful.